If you really want to rid rabbit from garden flowers, you'll probably need the solution that Beatrix Potter's Farmer McGregor used to repel Peter Rabbit: a fence. Most gardeners, however, don't care for the look of a strong wire fence around their flowerbeds. Other solutions are available! There are many ways to keep rabbits out of your garden. Why are rabbits such a common garden pest in suburban and urban gardens? Because there are so many of them! Rabbits reproduce rapidly. A female rabbit can breed at about the age of six months. Her litter will be born 31 days later, and she is likely to be pregnant again before she weans them at about six weeks of age. Domestic rabbits also reproduce rapidly, and pet rabbits that have been "released" into the "wild" by irresponsible owners are a growing problem in many areas. Under truly wild conditions, the rabbit population is kept in check by a variety of predators. Without those predators, they continue to reproduce and invade our gardens. Rabbits are mostly nocturnal. You may not see them in your garden, but you will recognize the damage they cause. They are random feeders, eating part of a plant, then moving on to the next. This maximizes the damage that they cause. 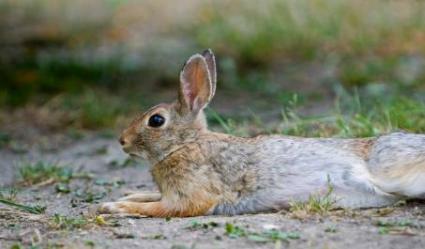 In the winter, hungry rabbits will eat almost any plant material they can reach, including the bark of trees and shrubs. A girdled tree is a dead tree. Many gardeners use repellents to keep rabbits out of their gardens. These substances have a smell or taste that rabbits find offensive, encouraging them to leave the garden and forage elsewhere. Repellents in pelleted or powdered forms can be scattered across areas that rabbits regularly travel or applied in a line around the perimeter of the garden. Since rabbits don't like to cross these boundaries, the garden remains safe from their attacks. Since rain will wash the granules away, the repellent will have to be reapplied frequently, although some commercial formulas withstand rain rather well. Bloodmeal is a traditional rabbit repellent used in this way. Commercial granulated rabbit repellents include Rid-A-Critter and Shake-Away. Some liquid repellents also act as barriers to prevent rabbits from entering the garden. Commercially available forms of coyote or fox urine are often used in this way. The scent of traditional predators can rid rabbits from garden flowers. Other liquids rely on the rabbits' sense of taste. These are sprayed directly on the plants, and rabbits won't eat more than a bit or two because of the terrible taste. Some gardeners make their own red-hot pepper spray for this purpose. Ropel Liquid is a popular commercial spray. These sprays must be reapplied as the plant grows, or the rabbits will eat the new growth while ignoring the treated part of the plant. Traditional scarecrows may frighten rabbits away from the garden for a while, until they become familiar with the object and decide it is harmless. So can owl cutouts. Banging and whistling devices are sometimes helpful, especially if they are motion-activated. However, the noise can also be annoying to homeowners and neighbors! A motion-activated water spraying device that targets spray toward the origin of the motion is usually very effective, if you can afford to install one. Animal netting can be a good rabbit deterrent if the rabbits are concentrating on a few choice plants. Just put it over the plant and peg it down firmly. The rabbits may be able to reach a few twigs, but most of the plant is out of their reach. Fences are the traditional way to rid rabbit from garden flowers. If you have included a decorative fence surrounding your garden in your landscape design, consider running one or two electrified wires along the exterior. A low-voltage intermittent electrical charge will not injure children or pets -- or wild animals, for that matter! -- but it will repel casual pests and rid rabbit from garden flowers.